Adam and I started a 28-day keto challenge last Monday and it’s going SO well. Honestly, I can see us sticking with this way beyond the original 28 days…except for the week we’re on vacation. I’m down over 10 pounds already and I feel so much better. With the exception of a couple days, it’s been surprisingly easier to give up carbs than I thought it would be. There are so many amazing recipes out there and so many quality substitutes for my most of my favorite foods that it’s actually not too hard to stick to. I made this Keto Chocolate Mousse last weekend and it totally satisfied my sweet tooth and dessert cravings. The only thing that’s been hard is having to eat out less (I hate cooking Friday and Saturday night) and not being able to drink. We aren’t big drinkers, but we like to go to local breweries on the weekend, so we miss that. Anyway, if you’ve been considering keto, I highly recommend trying it. And a big shout out to my friend Sarah for sharing her before and progress pictures/story and inspiring me to finally give it a try. Last year Adam and I canceled our cable service, so we’ve been spending more time doing other activities. I thought it would be fun to start playing games together, so I bought the card game Sushi Go after reading some reviews. It’s less than $10, so I figured it wouldn’t be a complete waste if we didn’t like it (or never played), but we love it! We’ve played it so many times. It’s quick and easy to learn, so it was the perfect choice for us just starting out. It can be played with 2 people, but you can also play with up to 5. We played it A LOT when Adam’s brother was staying with us for a week and it was really fun with 3 people. I also bought Forbidden Island, but we haven’t played it yet. It’s a cooperative game, so it would be a great game to play if someone gets a little too competitive. Honestly, we probably need to switch to this game soon because the competition is getting a little out of control with Sushi Go. If you have any other game suggestions for 2 players, let me know! 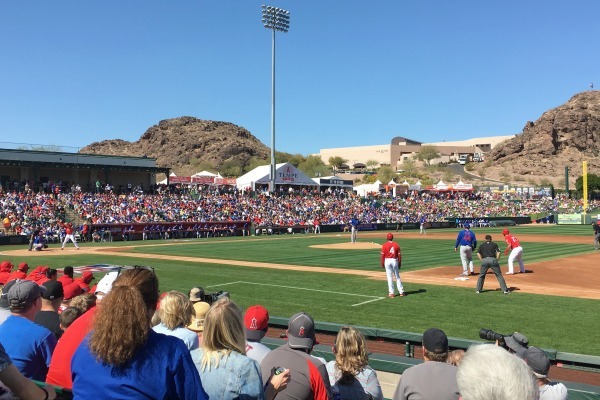 Earlier this month Adam, my dad, and I went to an Angels spring training game. Adam had bought the tickets for my dad for Christmas, so it was fun to finally get to go. We had great seats not far from the Angels dugout and it was fun to see some of our favorite players up close (my dad is a HUGE Angels fan). The weather was pretty nice, so we didn’t completely bake in the sun like some years past. It ended up being a really fun day at the game with my two favorite guys. 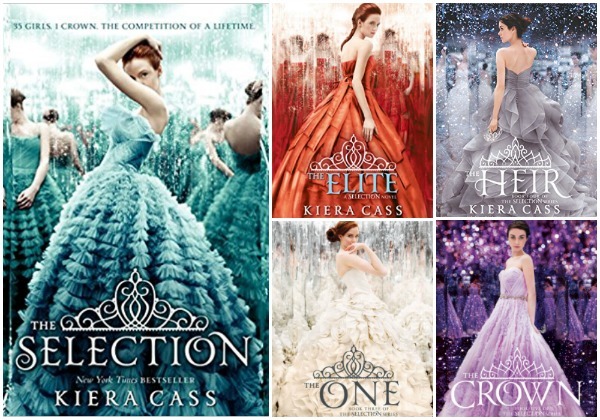 I have a confession to make: I’m obsessed with the YA book series The Selection! I found the first book at Goodwill a couple years ago and have been slowing the collecting the rest of the series. I eventually found the first 4, but they’ve been sitting on the shelf since. THEN, I was listening to Young House Love’s podcast and Sherry mentioned these books and how much she loved them. So I decided I should start reading them…and I finished the first 3 in less than a week! I would describe The Selection series as a young-adult dystopian Bachelor. The book follows America, one of 35 girls selected to compete to win the heart of the Prince Maxon and to become a princess. However, she loves someone from home and doesn’t want to win, but her family is a lower caste (the country is divided up into a caste system after a couple world wars) and could use the money from the competition. Of course she eventually starts to fall for Prince Maxon and has to decide between the Prince and her first love Aspen. It’s young-adult drama and I love it! 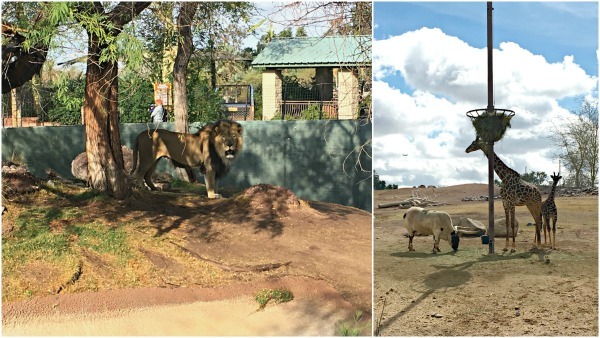 A couple weeks ago we went to the Phoenix Zoo for Adam’s nephew’s 3rd birthday. We got there first thing on Sunday morning, so it wasn’t super crowded and a lot of the animals were out. The male lion was actually walking around and roaring! Usually he’s just sleeping in the shade when we’re there. We also saw the new-ish baby giraffe (6 months old) and she’s SO cute! It was a fun morning out with Adam’s family and a fun way to celebrate 3 years! Congrats on doing so well with your new healthy eating routine! I've cut down on my sugar intake for the past year and feel so much better. 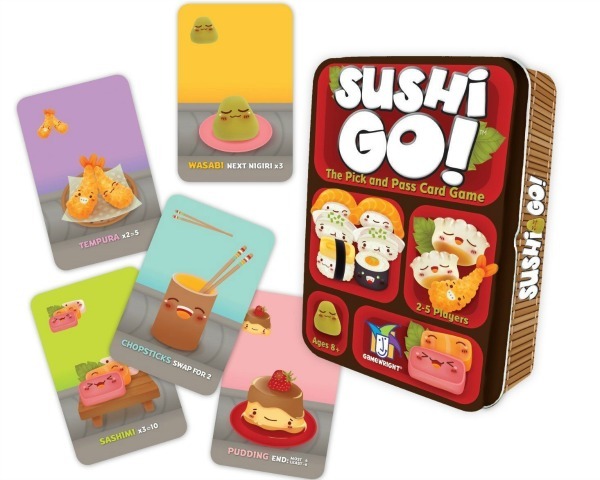 I've never seen the Sushi Go game but it looks like so much fun! Will have to keep an eye out for it. Thanks Caroline! 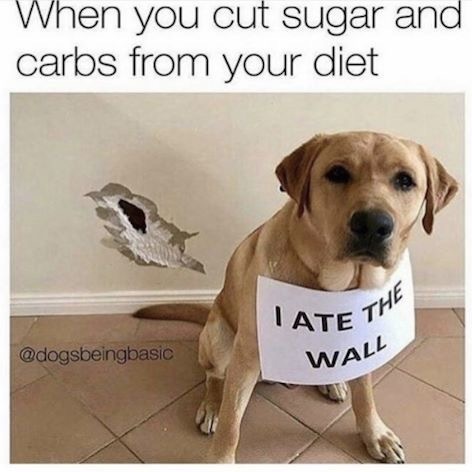 Congrats on cutting back on sugar! It's SO hard to give up, but you do feel so much better! That's awesome about your keto journey. Best of luck as you continue. I've been making slight changes to my eating habits, and I can definitely feel a difference when I stick to it compared to when I go back to my usual habits. I also love board games [Taboo, Scrabble, Bananagrams, ect.] and YA books. I may have to look into the series you're reading. I just finished a book, and I have one more lined up, but after that, I'm always searching for new books to read! YES! If you like YA books, you should definitely check out The Selection! I've never heard of Bananagrams! I'm going to go look it up! I think it's so much easier when you pick a set period of time. A month doesn't seem as daunting as changing your eating habits indefinitely! Good luck! I think that's the zoo my grandparents took us to as kids, and I loved it! Also, I'm so interested in the concept of the keto diet. Kicking the sugar cravings to the curb is something we could all probably benefit from! I'm definitely a sugar addict! It was so hard to quit, but I feel so much better. I love a good series and going to the zoo. I'd never heard of Keto before so I might be interesting in getting more information. Best of luck! You should look into keto if you're interested. There's a lot of information out there for free and so many recipes and helpful guides. Sounds like a fun week! I’ve got baseball on my mind with Cardinals season opening next week and a trip to the St Louis Zoo in the books as soon as this rain lets up! Happy Spring! Send the rain to AZ! We need it! Hopefully it clears up for opening day!